They'll be sent home booted as the location is discarded, but fair point. 'Your dude' is always dudes you control. Is there a way that we can make this colorblind friendly? Colours can be changed, but that'll be a formatting thing for someone else. The colours are still distinct enough for now. Finally, would it be possible to have names for the other variants? I'll leave it open to further input, but I think the theme names are suited to the formats (2 player, multiplayer elimination, multiplayer rulebook), while more straightforward names are useful for the options within those formats. Colors are just to indicate new sections. Eventually, it'll all be part of the standard rules compendium and normal black/print. In that case, I guess I'll put out my vote to rename Total Control from "Deadwood" to "True Grit". I'm not sure what idea "Deadwood" is meant to invoke (it sounds to me like it could just as easily be "Tombstone"), but "True Grit" implies endurance to me, which sounds like it fits a long game. Deadwood is 36 episodes of great TV about struggling to control a town on the western frontier in the 1870s, featuring characters like Seth Bullock, Wild Bill Hickok, Wyatt Earp and Calamity Jane. In a crowded field, I'd say it's the pinnacle of the Western genre. This one is pretty simple. We had three players. If we played Elimination, then one of the players has to sit out and twiddle their thumbs for 30 minutes or more as the other two finish the game. So we played Total Control. Both times we did this, we wound up having a player who lost pretty much all their dudes, and no real comeback mechanic. So they just wound up just playing kingmaker with no real hope of winning themselves. We also noted that Total Control games easily went for 2 hours. In a three player game, Turnabout just seems unnecessarily complex. In three quarters of our shootouts, it's just between two players so it's indistinguishable from Sequential Play. In the other third, we've never had a situation where the order of the secondary players have mattered. Maybe this makes a bigger deal if you play like 6 players, but for a three player game, I think we will always be using Sequential Play. This one is probably the most a matter of personal preference, but we chose By the Book to give players something to do while a shootout is going on. What we found happened otherwise was that the player would just walk away during the shootout, come back when it was done, and ask what the new state of the board was. With By the Book, they had some involvement. There are no easy fixes to these, but some additional variants to address them would be welcome. What about completely changing victory system? What do you think about using Victory Points system? Every Sundown when standard victory condition is checked every player earns a 1 VP for every player he could eliminate this turn eg. if player A has 5CP 4INF, Player B 2CP 5INF, Player C 3CP 2INF and Player D 1CP 1INF turn scoring is Player A - 2VP, Player B - 1VP. Player C - 1VP, Player D - 0VP. Game is played until any player earns X (5, 6?) Victory Points, but X should be scalable and one point higher for every player above three eg X+2 in 5 players game. I used to play a lot of multiplayer with a victory points system like the one @kempy describes above. The threshold for winning the game was equal to the number of players -1. "Number of Other Players Engaged" (aka Doomdog's "x-1" aka "NOPE") Victory Point system has a simple elegance to it. It means that on any given turn, if you beat every other player ("Deadwood" style), you win the game, which, is how it should be. That and it encourages teamwork. Say a bad beat leaves one player in the lead and one player distantly behind. The lead player now has a VP, and will likely obtain another one (by beating the same player again) the following turn. Hence, there is an incentive to cooperate to make sure that doesn't happen. Nope! Doomdog, if you were to compare the time it takes to finish a game of your Victory Point metric to the other two multi-player metrics (Elimination and Total Control), would it fall between them? Somewhere else? It's been a while since I played a multiplayer game with those rules, but we used to get a couple of games in on an evening so at a guess I'd say the games were quicker than other variants I've tried. For a completely different experience @Powder_Monkey has put together some interesting multiplayer rules that change things up quite a bit (including shared uniqueness between players and getting production from any deed you control). I'll see if I can find a link to the document. Howdy Cowpokes. I have tried uploading the file but as it is a word document, it won't allow it. 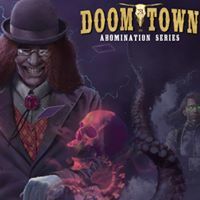 I did post it on the Doomtown Facebook page once before. Try clicking on this link. If it doesn't work, just go to the Facebook page and search for Multiplayer. Another 3-way multiplayer test, using the Victory Point rules that most closely match @jordan_caldwell's version. When checking for Victory, first check if a player has more Control Points than each other player's Influence (counted separately, not added together). If they do, then they win the game. If nobody won by the conditions above, then if any player has more control points than any other player has influence, they permanently gain one "Victory Point" for each player where this is the case. If the player accumulates a number of Victory Points equal to the number of players minus 1, they win. If multiple players simultaneously reach the required number of Victory Points, then use the Tournament Floor Rules for determining tiebreakers. One player had a rough start and each other player gained a Victory Point against them. After a round of nobody getting anything, we wound up with a situation where that first player did a deedslide comeback and managed to beat both other players by having a boatload of Control Points, and had they been unable to do that, both other players would have simultaneously gotten the last Victory Point. We were pretty happy with this outcome because the game would have ended one way or another, and the last round became pretty tense as we were checking and re-checking control points. Ultimately, it was a very satisfying game that addressed our concerns, and we would be in favor of this becoming an official variant. May I point out that the first clause is a corollary of the second. And where there may be cause for additional language - besides the replacement "VP" win condition set itself - it would be concerning how to adjudicate multiple players meeting this VP win condition. Which could either be along the lines of "play another turn" or "mirror the standard tie-breaker rules". May I point out that the first clause is a corollary of the second. I see where you are going with this: having more CP than each other player’s Influence gives you enough VP to meet the win threshold. I guess what we wanted to express was that one player beating everybody else simultaneously should get a match victory over a player bearing one player every turn. In our case, all three players would have technically gotten the required 2 victory points on the same turn, but we liked that the person who beat everyone else became the winner. That said, I could see the argument for not doing that and just having VP for everything. And where there may be cause for additional language - besides the replacement "VP" win condition set itself - it would be concerning how to adjudicate multiple players meeting this VP win condition. Which could either be along the lines of "play another turn" or "mirror the standard tie-breaker rules". Because one of our goals was to prevent games from taking too long, tie-breaker rules seemed better than more rounds. And, if the whole point is to have as long as game as possible, you can just simply decide ahead of time to play Deadwood style! Elimination is the shortest format, although the high stakes elimination can discourage aggressive play. In an elimination game, players are knocked out if they would lose by the usual metric (that is, if a player has more total control points than you have total influence at sundown, you are eliminated). When only player remains, they win! Apply the red rules text for Elimination games. Victory Point is a medium-length format, a compromise between Elimination and Total Control. In a Victory Point game, a player wins by earning a number of "victory points" equal to their number of opponents (ex. 2 victory points for a 3-player game). Earning a victory point is accomplished in the same manner as eliminating an opponent (using the Elimination rules), but instead of their opponent being eliminated, the player gains a permanent victory point instead. Victory points roll-over and accumulate as the game progresses. If two or more players meet this win condition at Sundown, before resolving tie-breakers normally, the player who has accumulated the most victory points wins. Apply the [color] text for Victory Point games. While Total Control is the longest format, everybody will be in the game until the end. In a total control game, a player wins by beating all other players by the usual metric (that is, if a player has more total control points than each other individual player has total influence at sundown, they win). Apply the blue rules text for Total Control games. Pasting some feedback across from Discord user SirMan given forum registration issues he is having. Victory Points (VPs) are interesting, but instead of making them permanent, how about staying with the "spirit" of the general rules, and make them like Control Points (CPs)? Something like adding VPs to cards that already have a CP, and maybe distributing them so that no Card can have more than 1 VP than another card with a VP. On Cards, VPs would count only if you both own and control the Card. I was thinking about VPs for multiplayer due to a recent 6 player game that took way too long to end. I am not sure I understand SirMan's proposal. But anything that invites Influence to count as Control Points changes the fundamental nature of the game from interactive to passive. It's like playing a totally different game with the same cards. The Victory Point concept discussed here can perhaps be thought of as, at the risk of being crass, "accumulating kills". Essentially, once your number of kills equals your number of opponents, you win. The reason I like it is because it essentially follows the same rules as Total Control, without resorting to eliminating (a potential NPE), by letting you progress towards the normal win condition incrementally, while also giving your opponents the opportunity interrupt / do so as well.